ConvertPDFsNow Toolbar is a browser plugin developed by Mindspark Interactive Network, Inc. Users download it voluntarily from the Chrome Web Store (chrome.google.com/webstore/detail/convertpdfsnow/iljadagannneobniklcocaonbnocinlk), its official website (ConvertPDFsNow.com/index.jhtml), or another third-party source because this application is promoted as a free PDF converter that allows users to “save time and money.” Researchers at pcthreat.com have tested it to find out whether it is as beneficial as it claims to be. Research has shown that it really enables people to convert PDF files, View PDF files conveniently, translate texts, and even convert DOC files. To make it clear, it does not do that itself, but provides buttons opening third-party websites with these features instead. Even though a number of users find ConvertPDFsNow Toolbar quite beneficial, it definitely cannot be called a fully reliable browser plugin, according to researchers. They have even decided to classify it as a potentially unwanted program because of the findings they have made. Users are the ones in control of the destiny of ConvertPDFsNow Toolbar, of course, but they should not forget that it is sometimes a good idea to listen to experienced specialists. What we want to say here is that the ConvertPDFsNow Toolbar removal is recommended. Users see a bar at the top of their browsers with My Tasks, Translate, Listen to the Radio, and weather buttons after the installation of ConvertPDFsNow Toolbar. 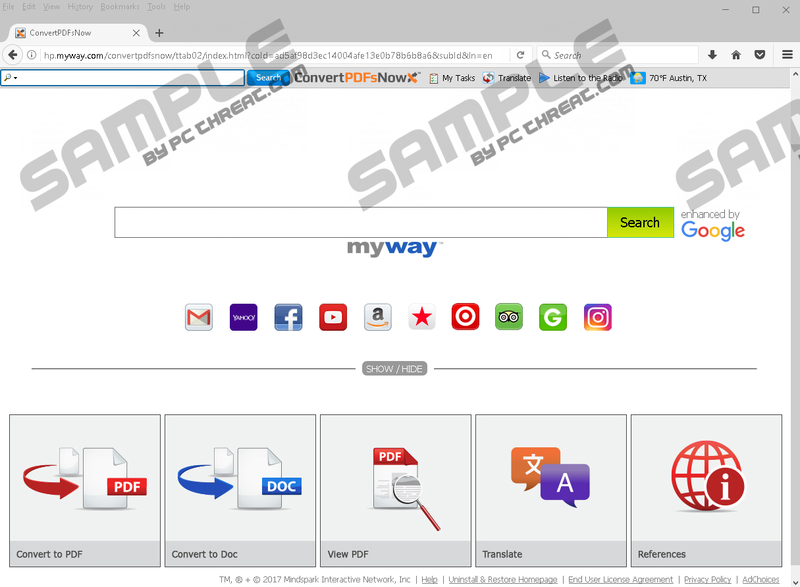 Also, homepages and New Tab page URLs are changed on all their browsers, so their preferred websites are replaced by search.myway.com promoted by this plugin. Actually, many users do not even suspect that a new web page will replace their homepages and New Tab pages, so they often do not relate the installation of ConvertPDFsNow Toolbar to modified browsers’ settings. Even if they do, our specialists have quite a negative opinion about this search tool set. Yes, it looks like any other ordinary search tool, and it is even enhanced by Google; however, it still cannot be trusted fully because of the third-party links that might appear on its search results page. They might be shown to users just to promote third-party websites and get money for doing that. These websites are not associated with ConvertPDFsNow Toolbar by any means, and the developer of this plugin does not control these third-party pages, meaning that users cannot know what to expect from them in advance. According to researchers, there is a slight possibility to be taken to bad websites spreading undesirable software too if the search tool set is used to perform web searches every day. Be careful! Before going to delete ConvertPDFsNow Toolbar completely, let’s find out how it, and many other Mindspark Interactive Network, Inc., toolbars are distributed. As has already been told in the 1st paragraph of this article, users can get this piece of software from its official website or the Chrome Web Store (the version for Google Chrome browser only). On top of that, it seems that this browser plugin is spread bundled with freeware too because users make complaints that a suspicious toolbar has been placed on browsers and their settings have been changed against their will. Since there are a number of other Mindspark toolbars which are spread the same out there (e.g. DirectionsBuilder Toolbar, QuickWeatherAlert Toolbar, and MyDigitalCalendar Toolbar), users should be cautious if they do not wish to find them installed on their computers again. First of all, it is advisable to install free software from third-party websites attentively so that it would be possible to see all items that are going to be installed together with it and thus prevent this from happening. Second, an antimalware tool should be enabled on every computer connected to the Internet. Instructions located below this article should be followed attentively to delete ConvertPDFsNow Toolbar manually from all browsers. If you are going to delete a program yourself for the first time, this process might be a challenge to you. Luckily, there is an easier way to get rid of undesirable programs – users can perform the system scan with a reputable antimalware scanner to erase all untrustworthy applications in the blink of an eye. Click Add or Remove Programs (Windows XP) or Uninstall a program (Windows 7/8/8.1/10). Select the undesirable software and click Remove/Uninstall. Press Win+E to open the Windows Explorer. Quick & tested solution for ConvertPDFsNow Toolbar removal.